The Queensland Transport Museum features a magnificent display of transport through the ages and displays over 200 models that explore the creation, founders and operation of the Transport Industry. 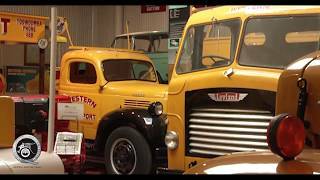 The main feature in the museum is the History of Western Maranoa Transport, which is a tribute to JC (Cyril) Anderson, his brother MJR (Curly) Anderson and also the men and women who worked for this renowned company. Displays in the museum are ever changing and each new visit takes you on a new adventure. The museum also features interactive displays as well as a couple of simulators. All visitors and children of all ages are encouraged to jump in the simulators and experience life as a rally car driver, a farmer, a race car driver or even pilot an aircraft! Indicative Prices $7.50 Adults AUD7.50. Pension/Concession AUD6.00. Children (six to 15) AUD2.50. Children under six are free.